The special feature of padded doublet is a quantity of buttons on the sleeves and bosom. This arming doublet was the most spreading model in the second half of XV century. Doublet has non standard bottom edge and fastenings for steel arms. Outer side: dark green linen Inner side: dark green cotton Layers of padding: 3 layers Length of the gambeson: a) to the fistons - 90cm (35,4 inches) b) full length - 95cm (37,4 inches) Length of the sleeves - 68cm (26,8 inches) Length of the shoulder - 18,5cm (7,1 inches) Сhest - up to 90cm (35,4 inches) Waist - up to 80cm (31,5 inches) Hips - up to 90cm (35,4 inches) .. This simple model of gambeson of XI-XV century is suitable for usage for both, men and women. Gambeson has 1 layer of padding. • All materials are 100% natural • Designed for: ➝ staged battles ➝ light fight ➝ training weapons fight ➝ larp Can be used with different armour: • brigandines • plate cuirasses • lamellar armour Men's sizes XS S M L XL XXL Chest 81-87 cm (32-34 in.) 88-94 cm (35-37 in.) 95-102 cm (38-40 in.) 103-109 cm (41-43 in.) 110-119 cm (45-47 in.) 120-129 cm (49-51 in.) Waist 63-69 сm (25-27 in.) 70-77 cm (27-30 in.) 77-84 cm (30,5-33 in.) 86-91 cm (34-36 in.) 92-102 cm (36-40 in.) 102-117 cm (40-46 in.) Hips 81-87 cm (32-34 in.) 88-94 cm (35-37 in.) 95-102 cm (38-40 in.) 103-109 cm (41-43 in.) 110-116 cm (44-46 in.) 117-124 cm (47-49 in.) 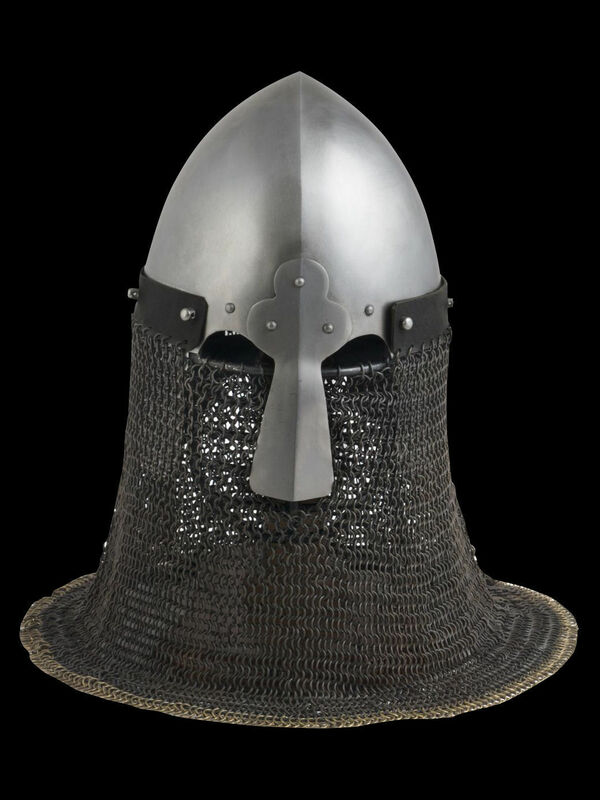 ..
Cale was popular medieval headwear was very popular type of headwear. It is kind of a cap with long strings for fastening under the chin. This model is made of natural uncoloured linen. Cale fits for head circumference 56-58 cm. .. Medieval cloak is made of dark red wool. It has hood and button for fastening under the chin. RG-55: Total length is 117 cm. For chest circumference 80-85 cm RG-56: Total length: 112 cm For chest circumference: 100-110 cm Following this link, you may order such model of medieval cloak with personal options and for your individual parameters. ..